Its most striking feature is its steep-walled gorge, carved by the Lehigh River over thousands of years. The park encompasses 6,107 acres spread along the length of the gorge and features famous sights like Buttermilk Falls, Glen Onoko Falls, Lehigh Gorge Trail, and the Turn Hole Tunnel. Located between the Francis E. Walter Dam and the town of Jim Thorpe, Lehigh Gorge is about 100 miles from Philadelphia and 118 miles from New York City, making it an accessible outdoor getaway from urban centers. Summer visitors can escape the city heat and enjoy whitewater rafting, biking, hiking, and fishing amid one of the most scenic parts of the state. Before Lehigh Gorge was a state park, it was the site of a bustling logging and mining operation—one so successful that the park’s forests were nearly destroyed by over-development following the discovery of anthracite coal in 1791. Naturalist John James Audubon visited in 1829 and was concerned by how rapidly trees were being felled and shipped down river, but unfortunately, this was just the start of development on the Lehigh. By the 1830s, the need to move the coal down river led to the construction of 20 dams, 29 locks, and five-and-a-half miles of canals. These huge locks and dams were so impressive that people came to call the area the "Upper Grand Section of the Lehigh Canal." Some remnants remain of the area’s industrial past. The canal system operated until a severe flood in 1862 destroyed it, and it was replaced by a railroad line to transport the materials. Today, you can still find the remnants of this industrial era as parts of the railroads, locks, dams, and towpath remains. Throughout the mid-1800s, trees continued to be clear-cut for lumber. A growing hide tanning industry along the Lehigh used bark for tanning, and the region once boasted the country’s second largest tannery—located on the river’s banks. But in 1875, a fire burned the remaining trees, driving away loggers for good. A brief resort boom came to the Gorge in the 1900s with the opening of Hotel Wahnetah and Glen Onoko Resort, but fires in 1911 and 1917 effectively ended that era as well. Realizing the importance of protecting Lehigh Gorge, the Commonwealth of Pennsylvania began purchasing the land in 1970, turning it over to the Pennsylvania Department of Conservation and Natural Resources, Bureau of State Parks, in 1980. The park is still administered by the department today, and it’s now a popular respite for all kinds of outdoor recreation, and a fantastic place to learn about eastern Pennsylvania’s storied past. Hike or bike on 26 miles of abandoned railroad grade turned trail along the river. You’ll spot several waterfalls, remnants of the old Grand Section of the Lehigh Canal, and wildlife, including snakes, lizards, and birds. You can refill water bottles at the Rockport Access Area. While at the Gorge, don’t miss walking through Turn Hole Tunnel, an 1860s railroad tunnel that was abandoned for good in 1956. The south side is open to pedestrians and can be accessed from the Glen Onoko Trail. Inside, walk over railroad ties to the north overlook. Look out onto the Lehigh and see the piers that still stand from the old railroad bridge. 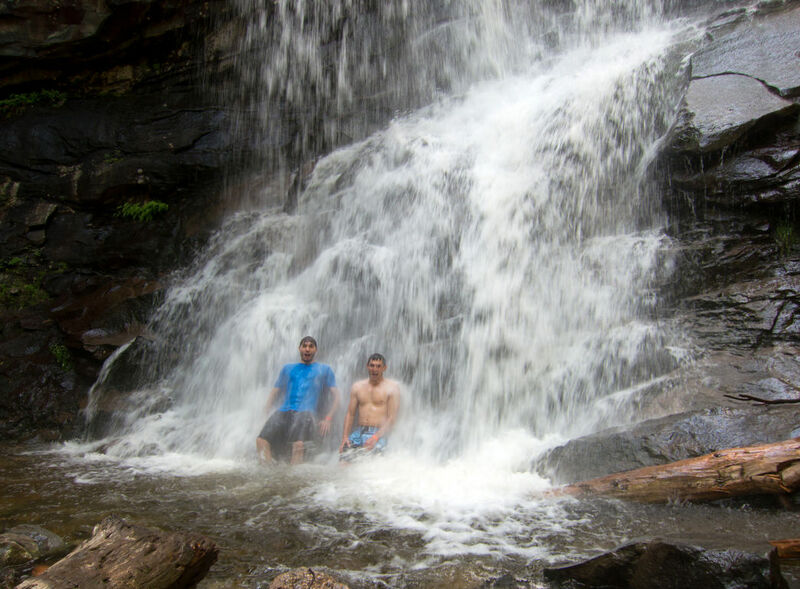 The waterfalls on the Glen Onoko Trail are some of the park’s most impressive sights. Showcasing some of Pennsylvania’s most spectacular waterfalls, the Glen Onoko Trail abuts the state park land and features three named waterfalls over 3.7 miles. It’s a difficult trail, so be sure your footwear is up to the task before taking this hike. For an easier waterfall walk in the park, follow a flat trail near the Lehigh Gorge Trail that leads to Buttermilk Falls, a cascading 50-footer that tumbles down a rocky ledge. Whitewater rafting is a popular summer pursuit at Lehigh Gorge State Park, and whether you like family-friendly Class I or II rapids or more challenging Class II to III whitewater, the Lehigh River delivers. Wind down the gorge where canyon walls tower high above you, and past rocky areas and stunning waterfalls as great blue herons and kingfishers fly overhead. River flow is controlled by the U.S. Army Corps of Engineers and the best way to up your whitewater ante is booking on a dam release day, when released water creates more significant rapids. Unless you’re a pro, don’t go it alone rafting the Lehigh’s waters. Professional, qualified guides provide safety equipment, transportation to and from the river, and have the know-how to get you down the rapids safely—making it a fun day out for all. Local guides include: Jim Thorpe River Adventures, Pocono Whitewater Adventures, Whitewater Challengers, and Whitewater Rafting Adventures. The Lehigh is a popular river for anglers, and the best place to cast a line is north of White Haven, where whitewater rafting is discouraged to promote fishing activities. This northern section is stocked with trout from the Francis E. Walter Dam to Sandy Run, and fishing is permitted when in season. You’ll also need a Pennsylvania Fish and Boat Commission fishing license to reel in your catch. Choose from open-air coaches or standard indoor coaches on the Lehigh Gorge Scenic Railway. Experience the park like guests of old with a railroad ride on vintage train coaches of the Lehigh Gorge Scenic Railway in Jim Thorpe. 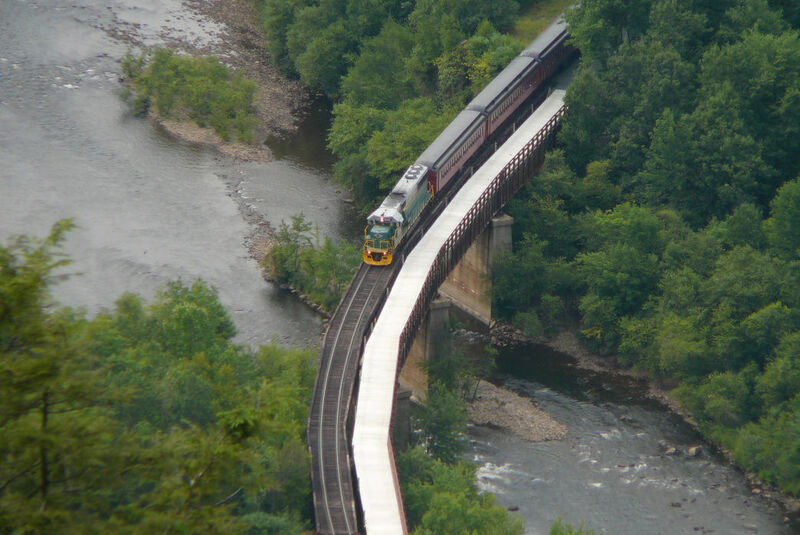 Tours begin at the historic former Central Railroad of New Jersey station and the narrated ride travels through Glen Onoko, on bridges above the Lehigh River, and into the state park for views of the gorge and surrounding mountains. Offered May to December; the round-trip is about 70 minutes. Choose from open-air coaches or standard indoor coaches. You’ll also find special bike trains running several times each month, which will take riders (and their bikes) on a one-way trip to White Haven. 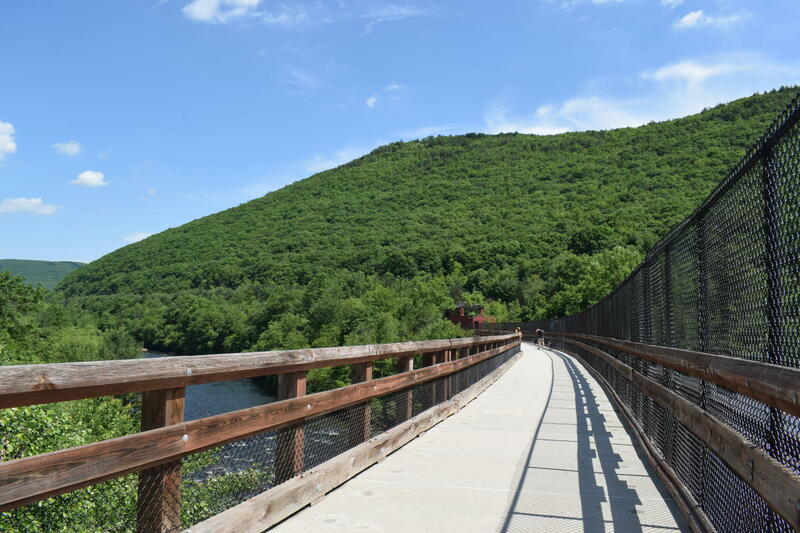 Once there, they can ride back to Jim Thorpe on the Lehigh Gorge Rail Trail at your own pace. Bike rentals are also available for those who need them. While in Jim Thorpe, take some time to explore its charming downtown. Many of the buildings date back to when captains of the coal industry made the town home. The Victorian-style structures now house antique shops, restaurants, museums, and galleries to explore. Want a real-time view of the town and the gorge? Take a peek with our live cameras! Learn about the history of coal mining in the region at the No. 9 Mine & Museum in nearby Lansford, which allows visitors to ride 1,600 feet into the mountain to explore a mine that was founded in 1858. In 2018, the region marks the 250th anniversary of the discovery of anthracite coal, and you’ll find special events celebrating the influence of coal mining throughout the area. At the museum, you can learn just how the miners were able to extract the coal from the ground, with artifacts and historical photographs to guide you. No matter how you choose to explore the park, you’ll enjoy incredible views of the rugged canyon and surrounding mountains. It’s one of Pennsylvania’s most unique destinations—and a getaway there offers visitors both a sense of history and an appreciation of its natural beauty.